Around 50% of the world's paddy rice production is parboiled. This process involves steaming or boiling the rice kernel while it is still in the husk and then drying it. Measuring moisture in the rice during the drying process can directly reduce the amount of energy required to dry the rice and will also reduce the amount of wasted material. 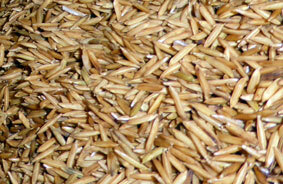 During processing the rice is initially soaked to achieve an optimum moisture level, typically around 30%. The rice is then heat treated by steaming or boiling until the moisture level in the rice is around 38%. Finally, the rice is then dried to a moisture level of 12-14% where it can be prepared for storage or further processing such as milling. Due to the changes in moisture of the rice during the parboiling process it is vitally important that the drying process is controlled accurately to ensure that the rice reaches the target moisture level when it is output from the dryer. If this is incorrect the rice kernels can break during the milling / dehusking process and in addition increased moisture may cause colour variations in the rice after polishing. This leads to wasted materials and unnecessary costs for the producer. If, for example, a single dryer is processing 16,000kg of rice every 12 hours, and assuming 2 shifts per day and working 5 days per week, this equates to 160,000 kg of rice processed per week. The installation of a moisture sensor could reduce the amount of rice being wasted due to broken or spoiled grains by 2.5% which equates to 4,000 kg per week. The current market price of rice (as of June 2016) is US $417 per metric ton so reducing the broken rice could save up to US $1,668 in just one week, or assuming a working year of 48 weeks, a total saving of US $80,064. A correctly installed sensor will measure the moisture levels of the materials exiting the drying tower to an accuracy of +/- 0.5% enabling the dryer to be controlled more precisely. Real time control of the dryer ensures that the dryer is controlled instantaneously resulting in increased energy efficiency. The installation of a Hydronix Hydro-Mix XT digital moisture sensor into the drying process is simple and will provide immediate cost savings and benefits to the producer. The sensor can be installed into new or existing systems and should be positioned so that there is consistent material flow across the measurement surface. Typical locations for the sensor would be on a conveyor before the rice enters the dryer so that the correct amount of energy can be calculated to dry the rice to the optimum target moisture level. Alternatively, depending on the individual requirement of the producer, the Hydro-Mix XT can be installed where the rice exits at the bottom of the drying tower to ensure that the rice is dried correctly before being processed further or prepared for storage. The Hydronix digital measurement technique ensures that the sensor is very stable and that the measurement is linear. This means that the sensor only needs to be calibrated once during the sensor installation and then checked as part of the normal quality assurance programme carried out by the producer.